The lead singer of the Senegalese band Tafeifa said something about music that I won't soon forget. Near the end of their high-energy show, he thanked WOMAD for having the festival, then said that it's not a world music festival, it's an our music festival. And it's true. There seems to be a quasi-stigma over"world music;" of exotic sounds played by obscure bands. But each country, each region, does have their own sound, and sharing these sounds is what music is partially all about-being able to communicate and convey emotions in a medium that doesn't necessitate being able to speak the same language. Takeifa is a band that really tries to make "our" music. 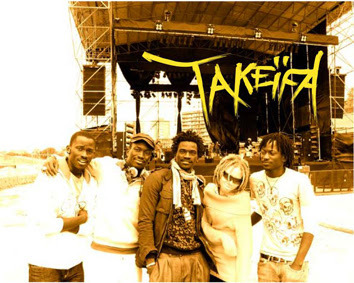 Singing in their native Wolof, along with English, French, and also a little Spanish, and drawing from influences from Afropop to Jazz, reggae to more Hispanic flavors, Takeifa has a unique sound, one that is filtered through a very African prism. "Get Free" showcases their unique flavors. While it always comes back to its original groove, the song flirts with a little Andean flute here, a little rap there, all sounds of a young band finding their sound while pushing their own creativity. Takeifa was definitely a weekend favorite, and I for one am really looking forward to hearing more from them.